I would recommend Neptune�s Harvest Organic Hydrolyzed Fish Fertilizer to anyone. I just wanted to send you this photo that my customer in SD just sent to me. 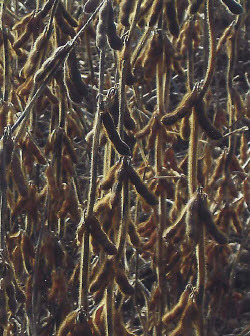 This is one of his soy bean plants, they counted 208 pods on this plant, at this point it is looking like they are going to get about double the average yield with their beans this year, and they had a summer with low rain fall for the area, so most of the farms around them are getting below average yields. Dear Ann, I have been using Neptune�s Harvest Fish Fertilizer for the last 4 years, on hay and pasture. The results I have seen include much healthier cows, and increased yields. Five Black Angus cows I sold recently, fed only grass fertilized with your Fish, weighed as follows: 2 at 1725 lbs., 2 at 1500 lbs., and 1 at 1200 lbs. Your product has saved us about $75.00 per acre, per year, since switching over from commercial fertilizer. We have no fly problems since using your Fish. The grass we cut for hay has doubled in yield. We had the grass tested and the TDN (Total Digestible Nutrients) were 58.67%. The lab in Georgia who did the testing said it was very unusual to see numbers this high. Usually we put lime every other year. This spring when they did the soil test, we were told we did not need to lime for the 1st time ever. This savings alone more than paid for the Fish we used. Pear trees that had fire blight, have shown no signs of it since spraying the Fish. They are now loaded with pears. 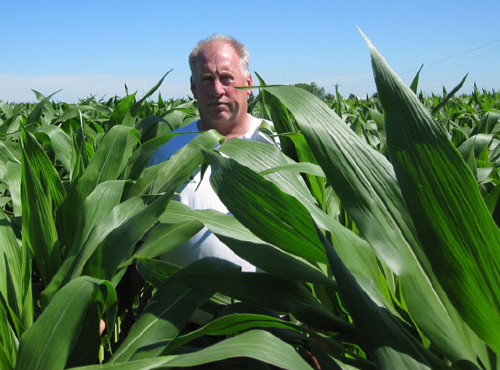 My neighbor who had some sweet corn that was sprayed with the Fish Fertilizer, said it was the best corn he�s ever had in his life. There were 2 to 3 big, real good quality ears, per stock. 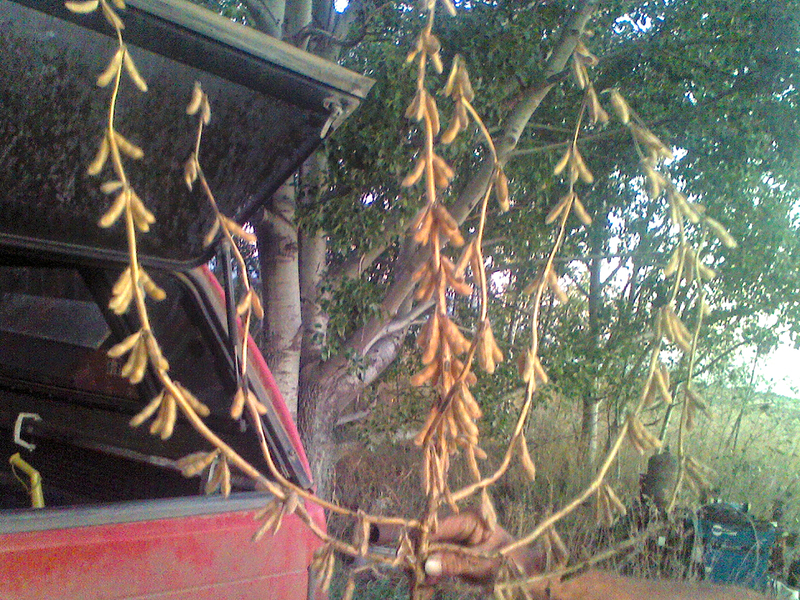 My beans for the last three years (2008-2010), regardless of the weather, have weighed 57# to the bushel. I feel the fish fertilizer is well worth the cost. 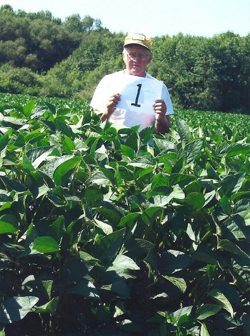 Read more about Gary's soybean success using Neptune's Harvest products! 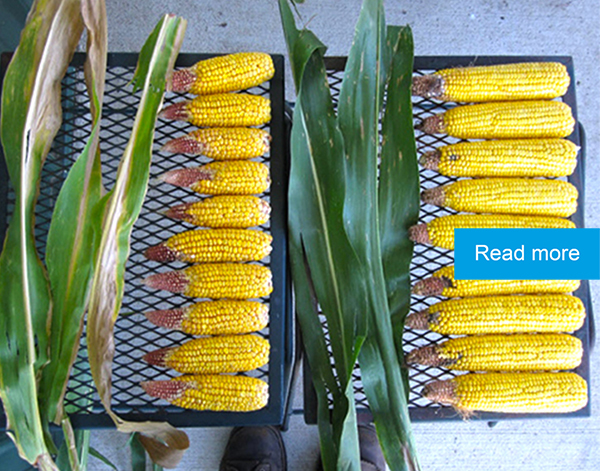 Ears are showing severe stunting and major "tip back"
Read more about these amazing corn-growing results using Neptune's Harvest! My wife and I, who are growers of soldier beans (10 acres) and soybeans (10 acres), have been so amazed by our yield this year on the fields where we sprayed Neptune's Harvest Organic Fish Fertilizer that we are planning to increase to 50 acres of each in the Spring of 2011. Seventeen to twenty-four pods per bean plant is unheard of, but that's just what we are getting. Other growers in the area are actually coming here to see for themselves what our fields are doing. One thing we noticed about our fields was that you can see the difference where we had not sprayed and where we started spraying by the colour of the plants: YELLOW where we had not sprayed with Neptune's Harvest and GREEN where we had. Our fields, sprayed with Neptune's Harvest, are still a lush green. Because of the remarkable qualities of Neptune's Harvest, we found that it is not necessary for growers to use binders as they have in the past in conjunction with their spray. We were also impressed by the fact that in the summer before I sprayed with Neptune's Harvest Fish Fertilizer, I noticed swarms of black insects on my soldier bean plants. Later that day, I sprayed with Neptune's Harvest and the next day, on examining my plants, there were no more black insects that day or for the rest of the season. We are so confident in Neptune's Harvest Organic Fish Fertilizer that we highly recommend it to all growers. I'm getting some more interest in the Neptune's Harvest products now that we have seen some good results from using it. We cut 99 huge heavy round bales off 70 acres three weeks after our second application of product. The grass grew really well in those three weeks and the paddock is coming back well despite us having no rain for weeks. A farm owned by a friend only 15 miles away has sandy soil and has had even less rain, has no grass, with the paddocks pretty badly knocked around and degraded. We have actually taken most of his herd and put them with ours as his alternative was to send them to the sale barn. After all of our fertilizing we have grass to spare, so it is working out nicely. That said, he is now very interested in switching from the traditional fertilizer ($60 per acre at the moment) to the Neptune's Harvest products, which are considerably less. Because of your products, we have plenty of grass for our herd, and my friends. Just a note to let you know how pleased we are with the results we receive by spraying on the Neptune Harvest Fish Fertilizer. The fish is the centerpiece of our fertilization program and has set our operation on the right path for the future of our grass finished beef and lambs. We get plenty of comments from forage specialist and professional livestock men and women, on our pastures that say "they are the best they have ever seen in the south and they were not aware you could grow this kind of quality forage in the south". Thanks for the great product, the proof is fat healthy cows and lambs without the big fertilization bill. Amazing product! As you know, we have been a loyal customer of yours for the last five years buying hydrolyzed fish for our 560-acre walnut orchard operation here in the great San Joaquin Valley of California. We mix it in a 600-gallon mobile trailer/tank and inject it into our solid set sprinkler system throughout the growing season when irrigations are frequent. The benefits of applying Neptune’s Harvest has been shown in other areas of the Garden also. We are still harvesting green leafy vegetables, in October, such as Swiss Chard, which were planted in April. During the hot, dry summer months, those plants had shown some signs of fatigue, however, in the days following their feeding of Neptune's Harvest they would stand tall and firm. We have also had great success with Brussels sprouts, which had failed in previous years, yet have grown to nearly five feet tall this year. The harvest of 2005 was exceptional for quantity and quality in all our varieties of walnuts. We harvested 35% more walnuts than our previous best year of 2003 with outstanding edible yield and color, important quality parameters for walnuts. I attribute our success to our fish program and other sustainable activities that we promote to whomever will listen. We would hope that you continue to provide a quality product with which we will continue to fertilize our orchards. I just wanted to tell you that last winter was the 1st year to feed hay fertilized with your Fish. 10 to 12 pounds per day, as opposed to 20 to 25 for conventionally grown hay, to maintain a body condition score of 4. These cattle are fed on winter range so they have �pickins� other than hay. Outstanding product!! P.S. I also fed 80% less mineral! I have seen so many great benefits since I started using Neptune's Harvest products. I use N.H. Kelp for my cattle as a mineral. I feed it free choice and they use about 1 - 2 oz. per cow per day. The cattle are healthy, with a good hair coat and their hooves are healthier than ever before. Since I started using the kelp, I haven't had to give even one antibiotic injection, and it�s been 2 years now. This is important, because we raise grassfed beef, with no antibiotics or steroids. We use N.H. Hydrolyzed Fish on our hay meadows and pastures. The benefits I have noticed is the thickness of the grass after using the product 2 years. 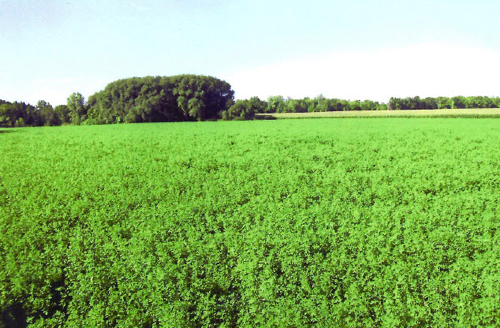 When spraying our pastures, we use Fish and liquid Humate with great results. We bought our farm 4 1/2 years ago and it previously had many chemicals used on it for weed control and synthetic fertilizers on the grass. The grass was thin and production was low. We have been really dry the last 2 years, but we still saw good results. I have a customer who raises organic fruits. The �tree experts� first told him that the fruit trees he picked would not grow in his type of soil. Well, with the help of N.H. Fish and Humate, the 2-year-old trees not only lived but they had 4 feet of growth this year. The "tree people" said that he would have some type of tree sickness from the fast growth, but that hasn't happened. This customer also uses N.H. Kelp for cattle mineral and his cattle have calmed down noticeably. Before using N.H. Kelp, he had a problem with coccidioses in his herd, but he doesn't see that anymore. I also fertilize residential yards, using the N.H. Hydrolyzed Fish. One customer is excited over the thickness of her grass and the growth and beauty of her flowers and shrubs. She also had an experience with armyworms this year. They crossed her yard without taking a bite of her grass, but her neighbors who use synthetics weren't so lucky. Needless to say, I gained a new customer next door!